I can’t believe I missed it! My last post was the 300th post on my blog. And it was about Brussel sprouts. I also just missed the 5th year anniversary of the blog. 5 years! January 2010 I wrote my first blog post. It was a new decade and I was looking for a forum to share my favorite things. I love all the progress I’ve made here. It is a fun journey. I’ve learned how to make so many new things, have shared my passion for literature, and even the occasional work of art. Thank you to all the people who have been so supportive along the way. I’m having a ball. And on that note, I’d like to share a drink with you. I love a good punch. I think it is one of the keys to a successful, low key party. Unless you are planning to just serve beer and tequila, (There is nothing wrong with just serving beer and tequila.) a punch gives you a fancy cocktail option without having to stand around with a mixer and take orders. I’d rather be mingling and playing Jenga than mixing drinks, any day. 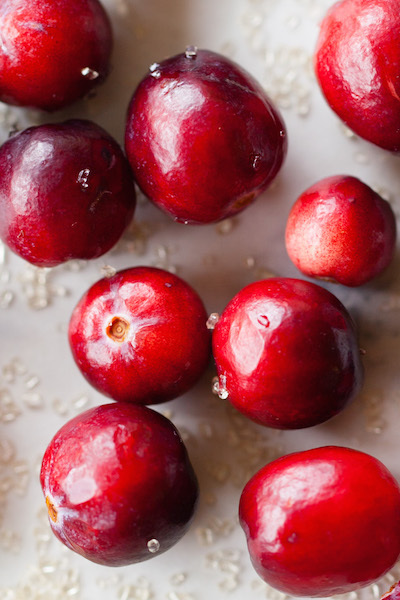 The time of year where you can get fresh cranberries at the store is shrinking. 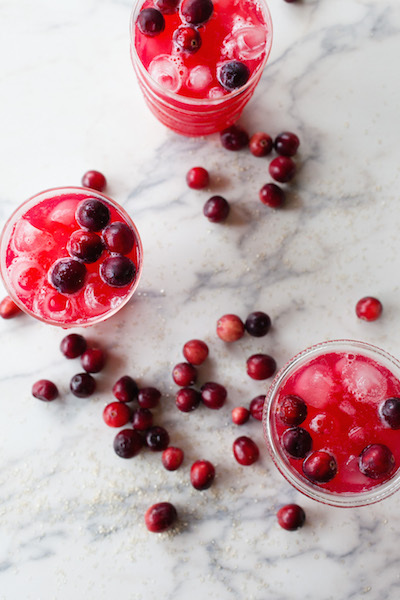 This is the perfect opportunity to grab those beautiful red balls and make something delicious. Did I just say balls? 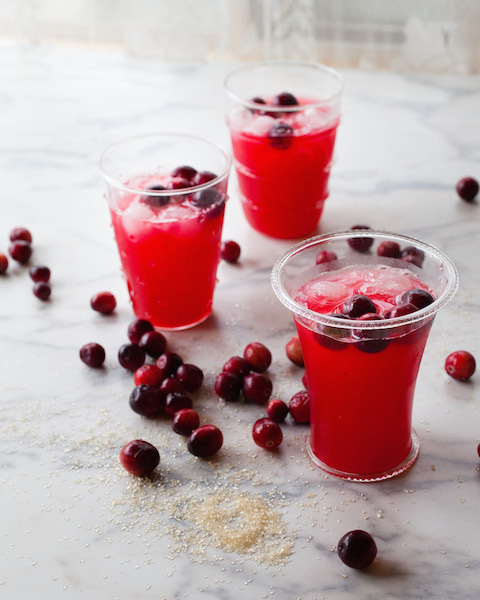 This drink is sweet, has a delicious tang from the cranberries and lime juice, and is an excellent color. Perfect winter drink. Great for the next time you have some friends over. Make a big batch and enjoy your night. So, here is to my 301st post! Tip a glass and help me celebrate. It has been a beautiful road so far. I can’t wait to see what comes next. Bring berries, sugar and water to a boil. Allow mixture to simmer until berries are bursting. Remove from heat and strain. In a pitcher, combine syrup, rum, and lime juice. Chill until cold. 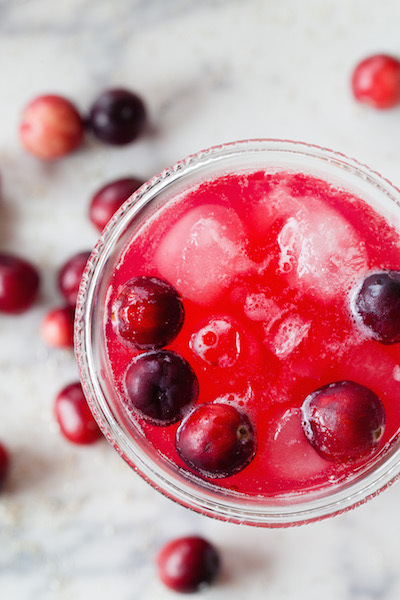 Serve over ice with cranberries and mint sprigs as garnish. This recipe makes about 6 drinks. Scale up if you are more than 2-3 people…. If your party has more than 2-3 people that is. If you believe you are 2-3 people, feel free to make the whole pitcher for yourselves. I do love the manner in which you have framed this particular difficulty and it does offer me personally a lot of fodder for consideration. Nonetheless, through what I have observed, I just simply hope when the actual remarks pack on that folks stay on issue and in no way embark on a tirade regarding the news of the day. Anyway, thank you for this fantastic piece and although I do not necessarily concur with the idea in totality, I regard the point of view. My husband and i were very thrilled that Ervin managed to do his reports with the precious recommendations he made while using the weblog. It is now and again perplexing to simply choose to be freely giving steps that a number of people have been selling. And we all consider we have the blog owner to be grateful to for this. The most important explanations you made, the simple site navigation, the friendships you can help to instill – it is mostly extraordinary, and it is letting our son in addition to the family understand the matter is enjoyable, which is certainly extremely serious. Thanks for all the pieces! Together with every little thing that seems to be building throughout this specific area, many of your points of view tend to be very exciting. Even so, I beg your pardon, because I can not give credence to your entire idea, all be it exhilarating none the less. It appears to us that your commentary are not entirely rationalized and in reality you are yourself not really fully convinced of the argument. In any case I did enjoy reading it. Thank you for any other excellent article. Where else may just anyone get that kind of info in such a perfect method of writing? I have a presentation next week, and I’m at the search for such info. I will right away take hold of your rss feed as I can’t find your e-mail subscription hyperlink or e-newsletter service. Do you’ve any? Please allow me know so that I may subscribe. Thanks.